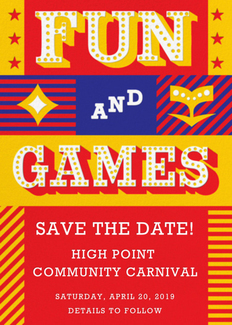 We are excited to announce our High Point Community Carnival! We are looking for volunteers to help with the carnival, silent auction, and other activities. Please sign up below if you are interested in participating. If you have any questions, please contact Christina at [email protected] Thank you! Help with ticket sales, event setup, and oversee event along with Development Team. Procure items and package items for silent auction. Help set up for the event - no heavy lifting! Help clean up after the event.